Little Pickle Press, 9781939775122, 36pp. When Rae witnesses an ice cream-and-doggie mishap, she's inspired to create a big-scale solution to help get dogs clean. Rae draws on her determination, resilience, and courage until she--and everyone else in her community--learns just what it means to be an entrepreneur. Rana DiOrio has been helping companies grow since graduating from law school. As a lawyer, investor, and investment banker, she has assisted hundreds of management teams in achieving their goals. Becoming a mother inspired Rana to find a way to align her career and values. 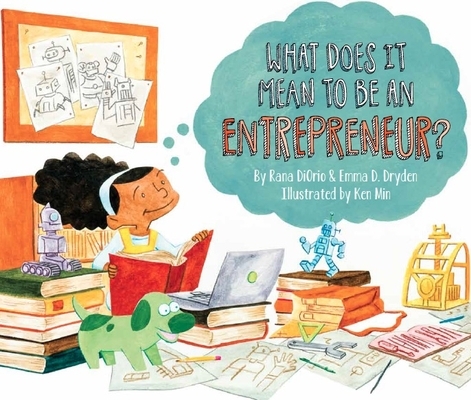 Her solution was to become an entrepreneur, founding Little Pickle Press in 2009 as a social mission company dedicated to creating media that fosters kindness in children, including her own. Rana sits on the Executive Committee and Board of the Independent Book Publishers Association, and the Advisory Boards of GrapeSeed, Stepping Stories, and Vanderbilt University School of Law. Her personal pursuits include fitness training, practicing yoga, reading non-fiction and children's books, dreaming big dreams and helping other entrepreneurs realize theirs, and, of course, being global, green, present, safe, and kind. She lives in San Francisco, California with The Cowboy and her three Little Pickles. Follow Rana DiOrio on Twitter at @ranadiorio. Emma D. Dryden is the founder of drydenbks, a premier children's editorial and publishing consultancy firm which she established after twenty-five years as a highly regarded children's book editor and publisher. During the course of her career, Emma has edited over a thousand books for children and young readers and during her tenure with Atheneum and McElderry Books, many of her titles hit bestseller lists in USA Today, The New York Times, The Washington Post, Publishers Weekly, and other national publications. Books published under Emma's guidance have received numerous awards and medals, including but not limited to the Newbery Medal, Newbery Honor, and Caldecott Honor. Emma speaks regularly on craft, the digital landscape, and reinvention, and her blog "Our Stories, Ourselves" explores the intertwined themes of life and writing. She can be followed online at Twitter (@drydenbks), Facebook, and Pinterest. Emma lives in New York City. Ken Min will tell you he was born on an ice floe and raised by a clan of penguins who read to him every night from the works of Margret & H.A. Rey, William Joyce, and DC Comics. He'll also say that he learned to paint by throwing his food at the walls. In reality he was born in Los Angeles and studied illustration at Art Center, College of Design. He has storyboarded for various commercials and animated TV shows such as The PJs and Futurama. His illustration work has been recognized numerous times by the Society of Children's Book Writers & Illustrators (SCBWI). In 2012, the first picture book he illustrated, Hot, Hot Roti For Dada-Ji, received the Picture Book Honor Award for Literature from the Asian Pacific American Librarians Association (APALA). These days, you will find Ken illustrating, storyboarding, writing, and dreaming up stories for children. Ken lives in Los Angeles.